This post was originally published in February 20017. It has been updated and re-published in January 2019. 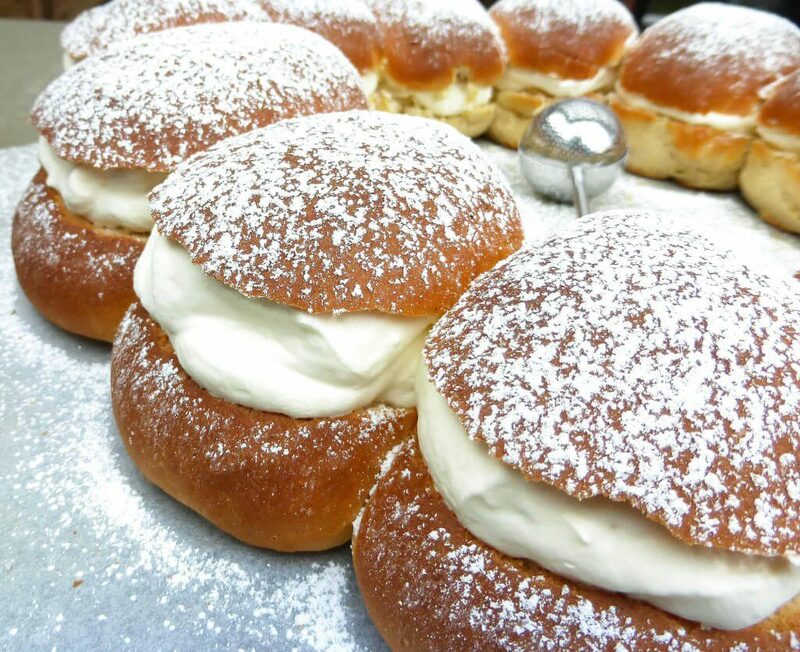 Ah, Swedish semlor. One of my favourite things about living in here in Sweden. Seriously though, I do like a semla or two. I like them even better when they are homemade. 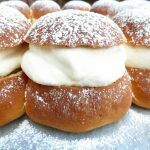 Semlor are traditionally eaten on Shrove Tuesday (or pancake day as we know it in the UK), but they are a bit like Easter eggs: widely eaten any time after Christmas, especially in the run up to the day itself. 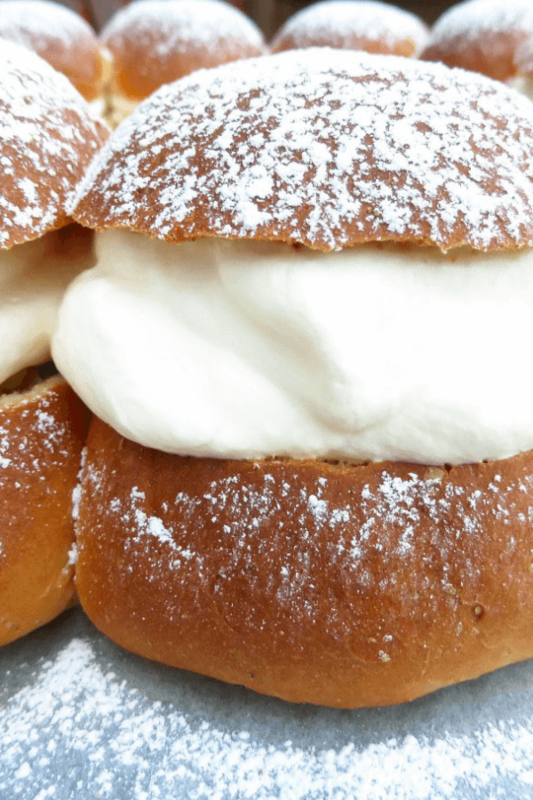 Apparently, an average Swede will eat five store-bought Semlor, as well as home-baked, every year! And believe me, it is not hard to see why (I’ve eaten four of them since yesterday – for testing purposes, you understand). 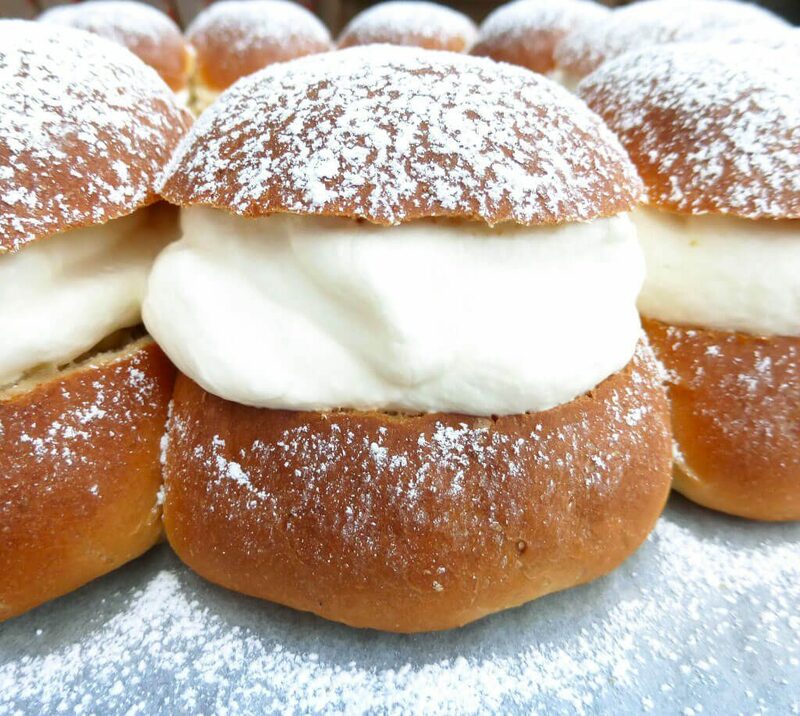 Swedish semlor are fairly dense buns made with regular plain (all purpose) flour. This time around, I did consider using bread flour to see how they would turn out, but didn’t want to change up the recipe too much when it is such an iconic, traditional Swedish favourite. Inside the semlor goes ‘mandelmassa’ which is an almond paste. It’s widely available in the shops here, but is so quick to make, and tastes way better than any shop-bought variety. They are then sandwiched together with oodles of whipped cream. De-licious. This year, I went a little fancy and made a ring of Swedish semlor, with each bun attached to the next, making them a sweet version of pull-apart bread. However, this was more for my pleasure at doing something a little different than anything else, so feel free just to keep them as individual buns (when on their own they are much rounder – being part of team they are slightly more elongated). The measurements below made 12 semlor, which is probably only necessary if you are entertaining and have tons of mouths to feed. I wasn’t kidding about eating four in the space of 24 hours, so if you are only feeding your family, halve the recipe and just make six. Because they are fairly dense, they are best eaten within a few hours of making them (at a stretch they will last until the next day, kept in the fridge in an airtight container). This recipe was taken from The Local (a Swedish online newspaper for expats) and some minor amendments were made to the original. To make the dough: Put the butter and milk in a small pan and heat just under the butter is starting to melt (the mixture should be no warmer than a lukewarm temperature). Remove from the heat and crumble in the fresh yeast. Leave for around 5-10 minutes so that yeast can activate. Beat the egg and add to the liquid, stirring to combine. In a large bowl add around 300g of flour, cardamom and sugar and stir to combine. Pour in the liquid and mix with a spoon until the dough comes together. Add more flour as required. The secret to soft bread is not to add too much flour, and semlor are no exception (see notes). Pour the dough out on to a floured surface. It should have pulled together but still be very sticky. Gradually add a little flour at a time until you can knead the dough, only adding more when it becomes too sticky to handle. Knead for around 6 minutes and then place the dough back in the bowl, cover with a tea-towel and leave to rise in a warm place for around 45-60 minutes. Knead again for about a minute until the dough is nice and smooth (add a little more flour if necessary but again, keep to a bare minimum). Line a large baking tray with grease-proof paper (you might need two trays if they are small) and divide the dough into 12 balls of similar size. If you are going for a joined circle effect like mine, place the balls in close proximity (although not touching) and they will join together as they rise and bake. If you want the simpler method, place each ball a good space apart on the baking tray(s). Cover and leave once more to rise for a further 30 minutes. Pre-heat the oven to 200°C (392ºF). Bake for around 15-20 minutes until the tops are very golden and the bottoms sound hollow when tapped. Leave them to cool under a tea-towel and when completely cold, prepare as below, or store in an airtight container until you are ready to fill them (semlor dry out pretty quickly). To make the almond paste: First, blanch the almonds in hot water for around 60 seconds and then remove the skins. Place the almonds in a food processor and blitz until they are fine, then add the sugar. Continue to process until a warm paste comes together (around 10 minutes). Add one to two tablespoons of milk until a spreadable but very thick paste forms. 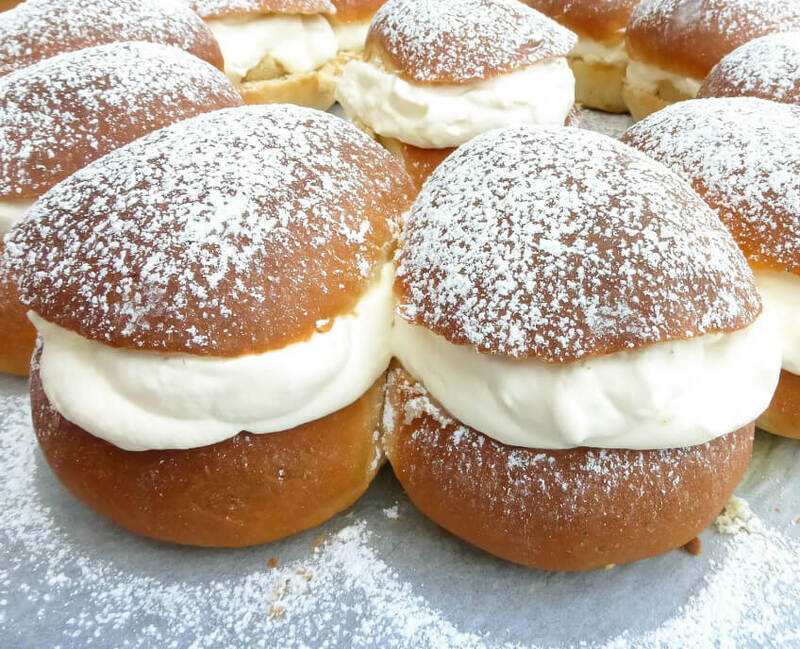 If you've followed my method and have a semlor "ring", very gently take the tops off with serrated knife. You probably won't manage to keep the tops as one whole piece (I didn't), but as long as the bottom bit hold together, it doesn't matter. If you have individual buns, just cut the tops off each one. Spread the almond paste equally over the bottom part of the semlor. Whip the cream until it is stiff and then spread (or pipe) over the almond paste. Top with the other half the buns and then liberally sprinkle with icing sugar. Serve and enjoy! For tips on how to make soft, delicious bread, check out my guidelines for making dough for any kind of bread.